"The bumblebee, according to our engineers' calculations, cannot fly at all, but the bumblebee does not know this and flies". After a few days behind the wheel I got to wondering if the Jeep Grand Cherokee SRT8 doesn't know it's not supposed to fly either. Disbelief alternating with elation are the two main emotions after just a few seconds behind the wheel of this beast. The 6.1 liters of Hemi power eventually becomes familiar, but the 420 horses and 420 pounds of torque never cease to entertain. Flooring it, I wonder why they didn't just call it Super Cherokee. This thing will out-sixty-foot any '60s or '70s muscle car, and give Porsche Cayenne displacement envy. Low 13-second quarter miles? No problem. Even so, the big boy is docile as long as one keeps his foot out of the loud pedal. Push that same foot inward, and a sweet soundtrack from the exhaust joins Atlas-rocket acceleration. When treading only lightly at the perceived limits of this machine, straight line elation turns to disbelief. Giant Brembos at all four corners make impossible corner-entry speeds easy to modulate. Velocity adjustment is quickly followed by equally improbable readjustment and acceleration out of the apex thanks to scads of instant V8 torque and an all-wheel drive system unique to the vehicle itself. The system has been beefed to handle the massive twist the Hemi creates. I got the impression the Super Cherokee would truly shine on a high-speed road course like Willow Springs. 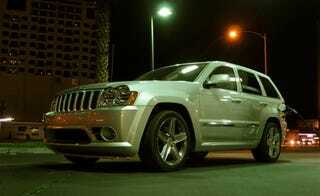 In fact, the SRT8 comes with a track-day experience as standard equipment. I only enjoyed a few days' driving in the Super Cherokee — which is admittedly on the high side of its product life span — but I wanted more. Given a few hours behind the wheel it's easy to forget the Super Cherokee is anything but a performance machine. A few weeks, and I may have completely forgotten I was driving an SUV. After a day or two the only way to remember you're driving a stonking 4800-and-change pound SUV is when you get out of it to tank up. Even after a few double-takes at the beast, the reality just doesn't register. It's sort of a vehicular fun-house-mirror effect. I had more than few opportunities to observe this hocus focus at work. My inner voice kept asking me if the vehicle I was looking at was in fact the same one I just took through that corner. While driving around solo in the beast is fun, sharing the capabilities of the SRT8 Grand Cherokee is much more rewarding. Riding around in Las Vegas with some of the folks behind the production of the vehicle, I began to truly understand the effort that went into the suspension to make a large beastie such as this handle like a slot car. This is a vehicle designed to make you want to drive it like a racecar. While in Las Vegas we had the honor of riding with Diane Sox, wife of the late and great Ronnie Sox. While I was cornering up onto the interstate, she exclaimed, "this reminds me of the way Ronnie used to drive"! Mr. Four Speed evidently liked to drive off the drag strip as much as on. SRT stands for Street and Racing Technology. The team puts their collective brain trust into otherwise ordinary rides and makes them extraordinary, and this is the kind of thing we just have to encourage. Behind the wheel of the Jeep Grand Cherokee SRT8 one ponders that perhaps the SRT crew had the same sign as Sikorsky did hanging in the development center when they hatched this beast. I don't know if the legendary sign at Sikorsky had a cartoon bee on it, but I'd like to think the sign at SRT would display a '68 Superbee as inspiration for the modern muscle infused into the Jeep Grand Cherokee SRT8.